The thirst for more storage seems unquenchable and the advancements in multimedia only boost our desire for space. We have definitely come a long way as far as cloud storage and various services go, but, there will always be the need for traditional storage media, one you can physically own and, better yet, carry around. The Samsung P3 might look like just another portable hard drive, but, the Korean giant has managed to cram quite a lot of innovation into the small package, quite literally. The top of the line P3 model features 4TB of space and while this is nothing to rave about in itself, it is the form-factor that is impressive. The drive is only 19.85 mm thick and weighs 236 g, which is impressive for 4TB of storage. The secret is that unlike most competitors, Samsung doesn’t use a multiple drive design to achieve the huge storage. Inside the shiny case, there is a single drive. This has also allowed Samsung to do away with some extra cables. Seeing how it is a single drive setup, it can be powered by a single USB 3.0 cable. So, the user isn’t tied down by additional adaptors, cables and most-importantly – an outlet. The 4TB P3 is quite an impressive feat, but, seeing how it is a totally novel solution, we can only imagine that its price will be hard to swallow. Thankfully, Samsung will also offer 500GB, 1TB and 2TB options for the P3. Those should be notably cheaper and also smaller – only 14.8 mm thick and 166 grams. 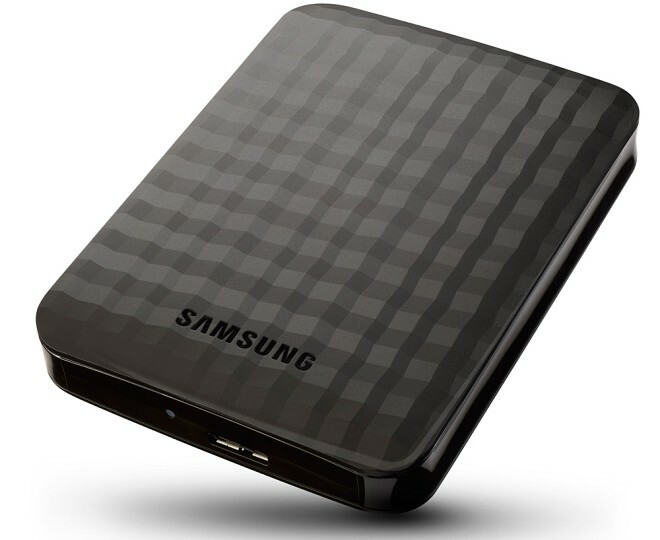 You can expect the Samsung P3 external drives to go on sale by the end of the month.